But when you add Andy’s job, with comic genius Don Knotts playing over-eager and bumbling Deputy Barney Fife, you create a whole other range of possibilities for humorous problems that Andy can solve. Mayberry isn’t just a backdrop, either. The citizens get a lot of air time, and their stubborn, provincial ways constitute yet another group of patients in need of Sheriff Taylor’s magic tonic—always a blend of common sense, insights into human nature, and Solomon-like judgment. And Andy’s morals are within easy grasp of youngsters, too. 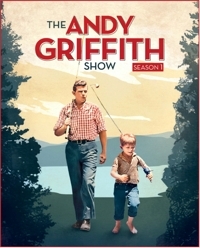 According to a 1967 Nielsen study, The Andy Griffith Show was the #1 series among blue-collar workers and #3 among white-collar workers, and it remains one of just three series to finish its run in the #1 spot, joining I Love Lucy and Seinfeld. This first season, Griffith played Sheriff Taylor more folksy than he would in later years, and more than a few episodes ended with him sitting on the front porch with his guitar, serenading his “kinfolks.” In one classic episode, a state police task force uses the sheriff’s office as headquarters for an operation to catch an escaped convict, and they exclude Andy and Barney. But Andy plays a hunch that should have occurred to the state police and he and Barney end up catching the fellow, with the help of Andy’s leaky rowboat. In another solid episode, Andy helps a mountain couple he likens to Romeo and Juliet, and stops a generations-old feud in order to get the pair married. This season, Andy’s girlfriend, Ellie Walker (Elinor Donahue), runs for council and divides the town over the role of women, and Andy gets put on the spot when he’s asked to judge a local beauty contest. This season, a stranger in town upsets everyone because he knows all the intimate details about Mayberry and its residents, and Andy tries to teach Opie a lesson about honesty and truthfulness while stretching the truth to sell the town’s junky Civil War cannon. It’s tobacco country, so there’s occasional smoking, and fictional Mayberry is in the foothills of Appalachia, so there are poor folks who are accustomed to making their own liquor, no matter what the law says. But to underscore how “innocent” it all is, in an episode titled “Alcohol and Old Lace” Barney and Andy follow a moonshine trail that leads them straight to a pair of sweet little old ladies. Town drunk Otis lets himself in and out of the jail, and Andy treats him as he is: a friendly neighbor who has a problem with alcohol. Though there’s drinking, none of the main characters imbibe and alcohol provides some rather benign criminals for the lawmen to arrest and rehabilitate. In “Christmas Story,” Mayberry’s scrooge reports a local moonshiner on Christmas Eve, but Andy brings the man’s family to jail, “arresting” them as accomplices so they can all spend Christmas together. By episode’s end, it’s clear that old Ben Weaver was just bitter about being alone, and the moonshiner vowed never to make the stuff again. 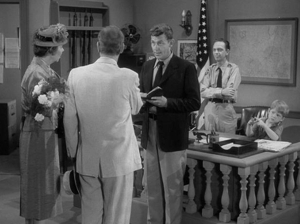 It’s all pretty simple and moralistic, but rich characters, strong writing, and an abundance of gentle humor make The Andy Griffith Show a winner, still. And as a bonus, the 1986 nostalgic movie Return to Mayberry is included. Unlike I Love Lucy on Blu-ray, though, it’s not a slam-dunk transfer. Despite improved depth and detail, some episodes feature some pretty heavy grain and noise, though the majority of them are an upgrade from the DVDs.